Lola’s farm flourished, producing abundant harvests of poultry, vegetables, peaches, pecans, sugarcane, dairy items, and more. “She made and sold soap and canned goods—a lot of what we call ‘value-added’ now,” Taylor says. When Lola’s children and grandchildren moved away from the farm, she sent them baskets of her harvest. And she earned a reputation for sharing food with others in her community. As Lola grew older, she could no longer do the farm work, and the land lay fallow. 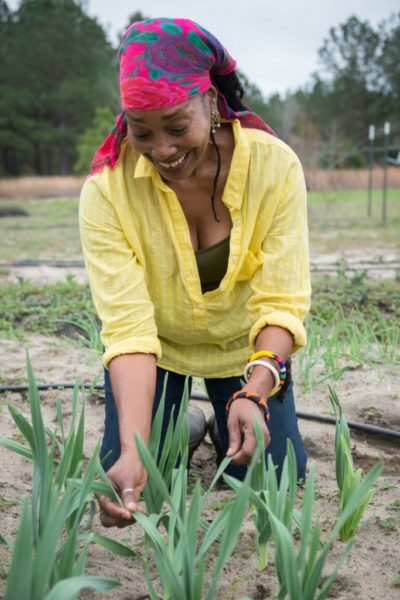 In 2010, Taylor, along with Ronald Gilmore, her husband, returned to her grandmother’s farm and relaunched it as Lola’s Organic Farm. The farm today is 32 acres of certified-organic land, with the majority in woodlands. The couple work 3 acres, raising strawberries, blackberries, muscadine grapes, persimmons, apples, figs, and pomegranates, along with onions, peppers, several varieties of kale, sweet potatoes, Asian eggplants, ginger, and turmeric. 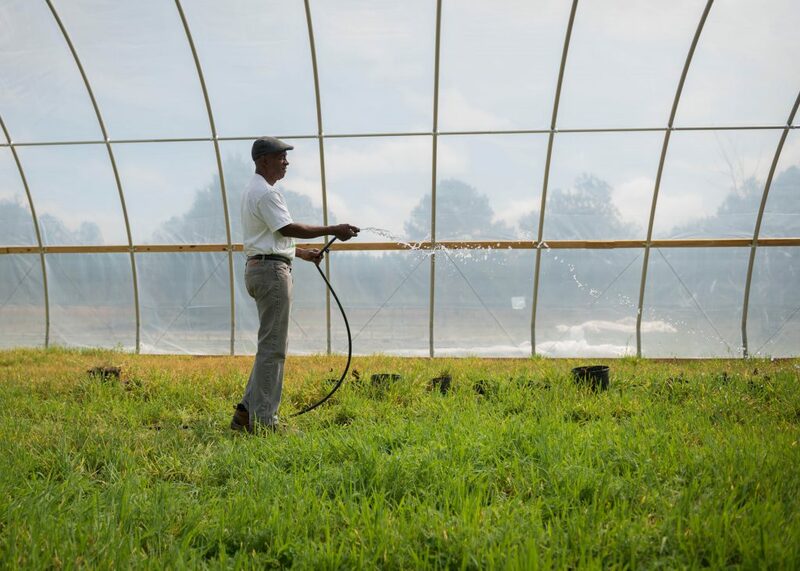 Georgia’s climate and high tunnels allow them to grow year-round. “We’re small, so we need to grow items that our customers really want but will not find easily” from other sources, Taylor says. The farm’s harvest is sold to regional food distributors, to a co-op that offers it directly to customers through local farmers’ markets, and to a variety of grocery stores and restaurants in the area. The two-person operation is low-tech. 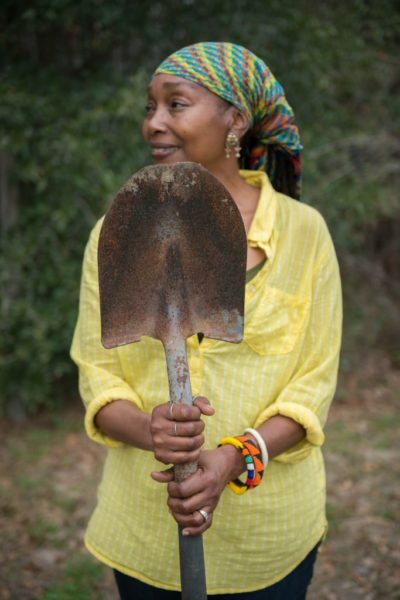 “We do most of the work with hand tools—shovels or hoes,” she tells us. “We contract with some of our neighbors to cultivate and do other jobs that need big equipment.” Their watering method is what Taylor calls “rain-fed agriculture,” which they supplement with a microirrigation system funded by a program from the USDA’s Natural Resources Conservation Service (NRCS). Bermudagrass proved to be another obstacle. “On the one hand, it prevents soil erosion,” Taylor says, “but when you’re trying to grow vegetables, it’s a real problem.” With a grant from the USDA’s Sustainable Agriculture Research and Education program and guidance from Schonbeck, the couple set up a comparison of two systems for controlling the weed: use of intensively planted cover crops—a rotation of field peas, millet, and buckwheat—versus multiple tillage passes. “The difference was easy to see,” she reports. “The vegetables following cover crops had much more vigor” than those grown in the tilled plots. She also found better soil structure and more microbial activity in the plots where the cover crops grew. The farmers have since added barley, hairy vetch, and subterranean clover to their cover crop regimen. Along the way, they observed that the Bermudagrass was helping to control nutsedge, another pesky weed on their farm. With some experimentation, they discovered that intensive planting of sweet potatoes also controls nutsedge. “Now we plant them for both weed control and food,” Taylor says. While producing food for themselves and their community, Taylor and Gilmore also devote time and energy to teaching other farmers. At their annual farm day, other growers come to learn about organic farming practices that work in their region. Taylor now serves on the Organic Farmers Association Governing Council and is the vice chair of the OFA Policy Committee. “I see it as a great opportunity. Organic farmers [have] to find their voice in their own community and bring that to the public,” she says. Taylor believes a publicity campaign is needed to explain to consumers why the certified-organic label is so valuable to them. “There’s so much confusion in the marketplace with lots of different labels claiming to be ‘natural,’ ” she says. “We need to help the public understand and appreciate the full breadth of the meaning of USDA certified organic and its benefits for the environment, for the farm and farmers, for the consumer.